Now that Halloween is officially behind us, I bring you something healthy and green: apple cider glazed Brussels sprouts! I figured we all probably needed a recipe that was on the healthier side after consuming copious amounts of sugary sweets and treats over the weekend. Don’t worry though, these Brussels sprouts still have apple cider and bacon so it’s not like I’m giving you something bobo and flavorless like rice cakes and water chestnuts. 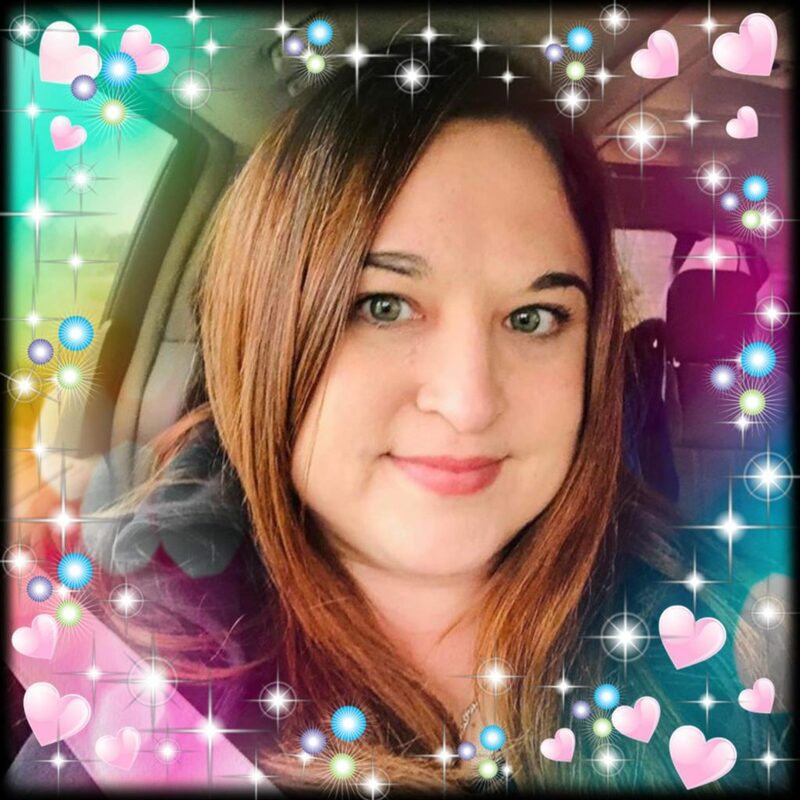 Come on, peeps, hopefully y’all know me better than that by now. Hallelujah! We were finally able to celebrate Halloween this year! Two years ago, Will and I were deep into studying for our real estate exams and last year Owen was just a wee sprite so, because he was a preemie, we weren’t able to take him out in public until three months after his DUE DATE which was Oct 21st. So, yeah, we were pretty much hermits at the end of last year. 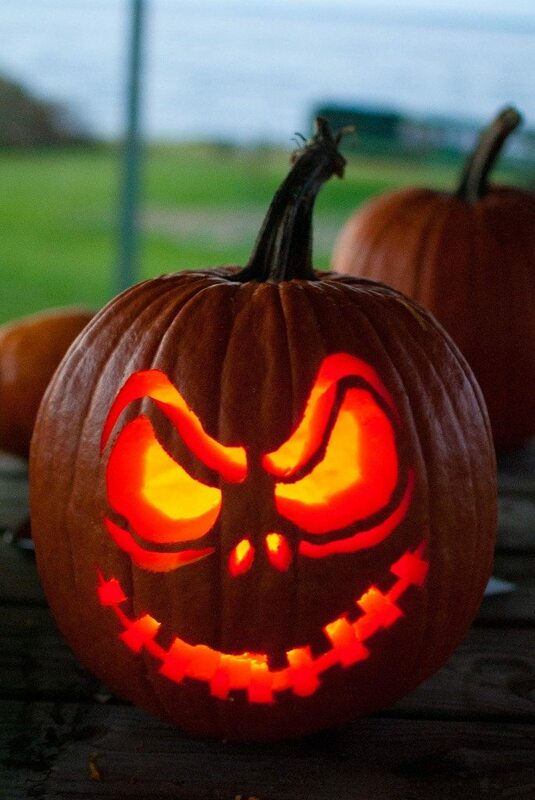 This year though I insisted on going fall harvest ca-ra-zay, and we went went to a pumpkin patch, ate Pumpkin Pie blizzards and other such goodies and carved pumpkins with our North Carolinian (by way of Mexico) niece and nephews. 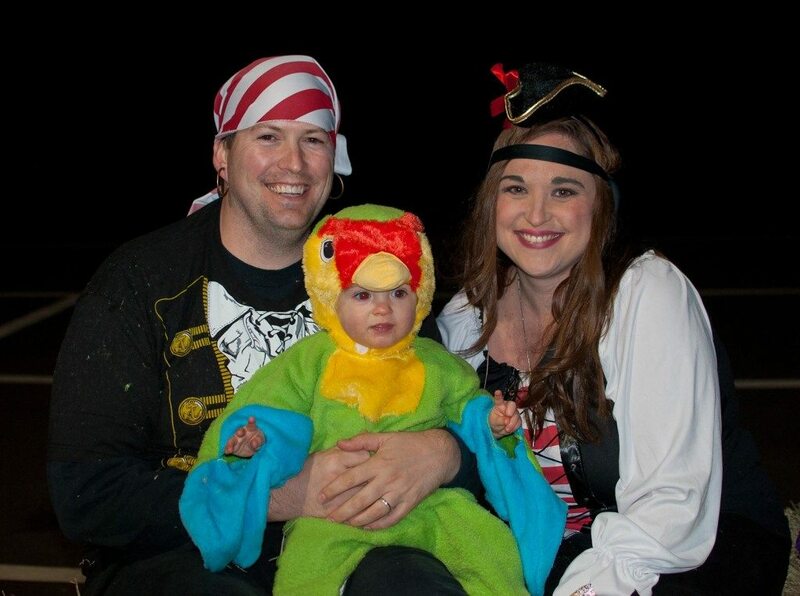 Then Will and I dressed up as pirates, Owen was our parrot, and we went trunk-or-treating at our church. I figured today would be the best day to post these Brussels sprouts because they are full of fall flavor and would be an incredible addition to your Thanksgiving menu. Everyone likes to plan their Thanksgiving menu, like, four and a half weeks in advance, right? No? That’s just me? Hmmph. Anywho, I know I’ve mentioned it before, but Brussels sprouts are like candy to me. I could eat them all day errday. When they are roasted or pan seared their natural sugars come out, and they are finger lickin’ frickin’ gooooood. These apple cider glazed Brussels sprouts are even more flavorful than the standard side and are super easy to whip up. If you want to keep these vegan, you can easily leave the bacon out, no big whoop. I just think the smokiness of the bacon adds a special touch to the spicy sweetness of the rest of the dish. Oh! And the butter? Don’t leave it out unless you have to! It really just gives the glazed Brussels sprouts that last bit of oomph and pizzazz that’ll make your friends say, “Wow! 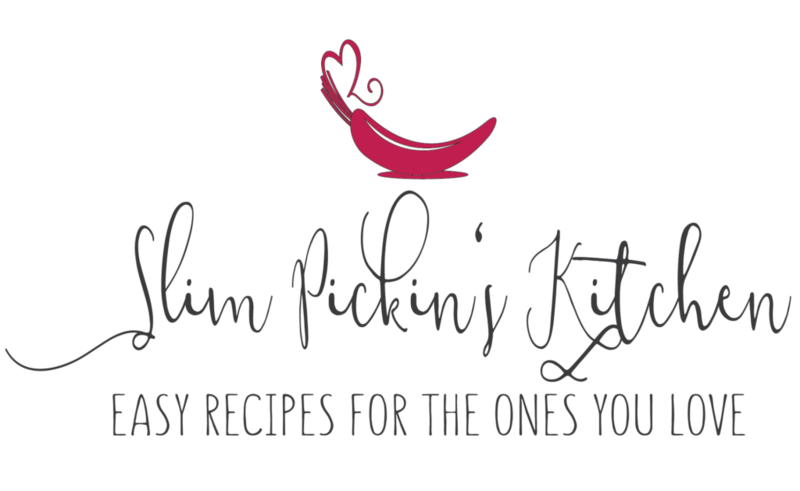 I must have this recipe!”. Add a few layers of paper towels to a plate and set aside. Heat a large skillet over medium heat and, once slightly smoking, add the bacon to the pan. Saute and cook until the bacon is crisp and golden brown. About 3-4 minutes. Remove the bacon with a slotted spoon and place on the paper towel lined plate. Pour off all but 1 tbsp of the bacon grease, and place the Brussels sprouts, cut side down, in a single layer in the pan. 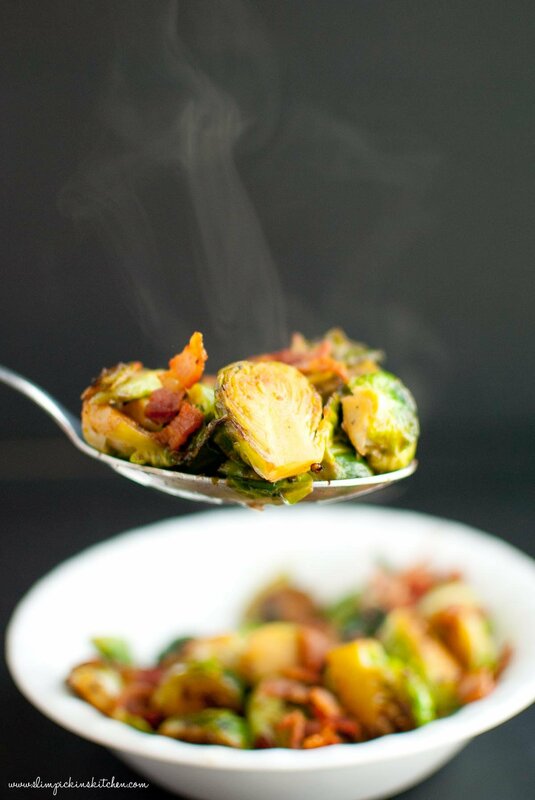 Cook the Brussels sprouts until they are golden brown and the sugars have caramelized, about 3-5 minutes. Add salt and pepper, 1/3 of the apple cider, and toss and saute until the apple cider has reduced and almost cooked off. Add another 1/3 of the apple cider and toss and saute, as before, until the apple cider has reduced and almost cooked off. Add the last 1/3 of the cider and toss and saute until the cider has reduced and the sprouts have completely cooked through. Add more salt and pepper (if needed), toss the bacon bits back in then add the butter and stir until melted. 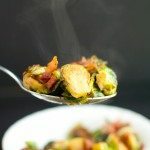 I LOVE brussels sprouts and always am looking for new flavour combinations to try out with them – never used apple cider before with sprouts, definitely a recipe I need to try.. they look and sound delicious! Thanks, Thalia! Let me know if you try them! 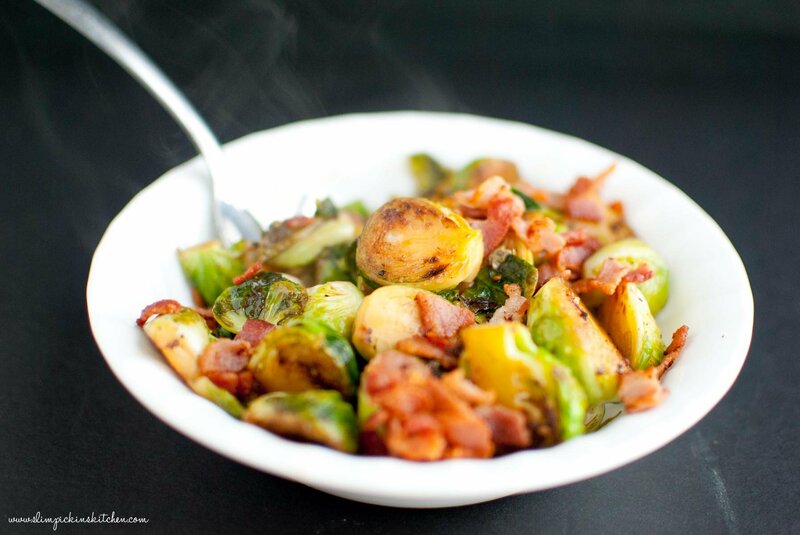 These sound delicious, I love brussel sprouts – can’t wait to try!